According to the Oral Cancer Foundation, approximately 43,250 men and women in America will be diagnosed with oral cancer this year. Sadly, only slightly more than 50 percent of these people will survive past the five year mark following diagnosis. Research has indicated that patients whose cancer is diagnosed early have a considerably better prognosis, making oral cancer screening an integral component of preventive dentistry. At Juno Beach Restorative & Aesthetic Dentistry in Juno Beach, FL, Dr. Duane E. Keuning and Dr. Greg K. Riley offer a comprehensive array of preventive dentistry services designed to preserve your oral health and your smile. One of these services is oral cancer screening. 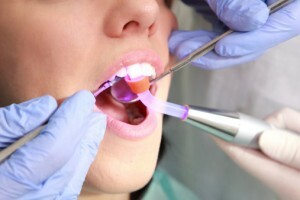 Oral cancer screening involves the close inspection of all soft tissue surfaces within the mouth and the throat. Utilizing only the latest in diagnostic technology, our doctors are able to detect the presence of abnormal cells before any physical signs are present. Because cancerous and precancerous cell formations may be invisible to the naked eye, oral cancer screening is vital to early detection. If you notice any of the above symptoms, please contact our office immediately to schedule an appointment with our doctors. While these symptoms do not necessarily mean that you do have oral cancer, they should be evaluated and treated as soon as possible. Because early detection is such a critical factor in the successful treatment of oral cancer, our team performs screening at each routine dentistry visit. These general dentistry appointments should ideally be scheduled every six months or more often if specified. Protecting yourself from the dangers of advanced oral cancer is as easy as calling our office and scheduling your visit today. Our conveniently located Juno Beach, FL dental practice warmly welcomes patients from throughout the surrounding areas as well, including Palm Beach Gardens, Tequesta, North Palm Beach, and beyond.